IDSL have two philosophies that promote this section. 2) To prevent the consumer going to those overpriced out of town computer stores that are only interested in selling you a computer that may not be suitable for you. 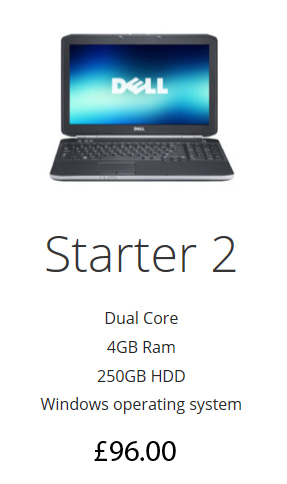 To this end we can offer a range of affordable laptops, desktops and games computers with the backup of a warranty and also the recommendation that its right for you, from our experts. With PC’s from IDSL you can rest assured that the old adage of “the more you spend the better the machine” is ABSOLUTELY what you will get. There are no special sales leaders, no machines that will earn the salesperson more money than a better cheaper computer. Remember that IDSL will specify the one you need from your requirements and you needn’t spend more money than you have to or can afford. 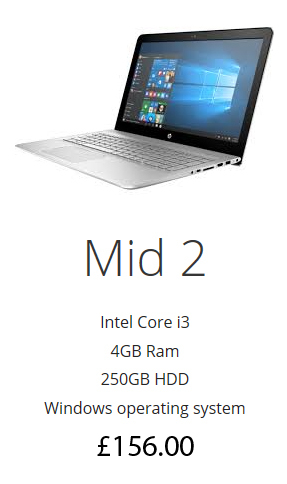 A perfect cheap light laptop that is designed for one thing only, The Internet. Surfing, shopping and Webmail. 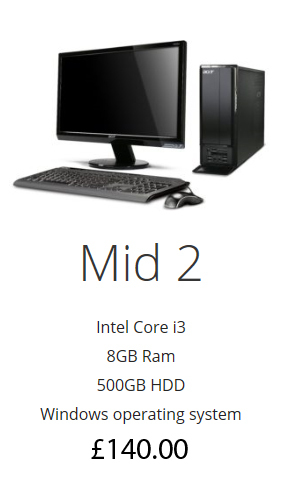 Not suitable for gaming or word processing, but may play the low end webgames. 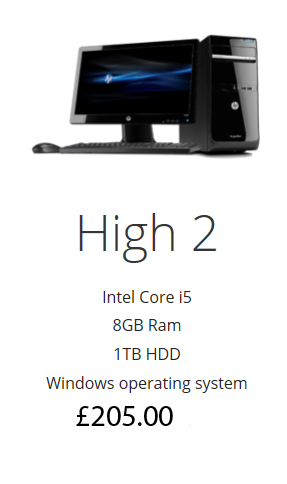 Typically a small 10″ screen to keep the machine small and lightweight. 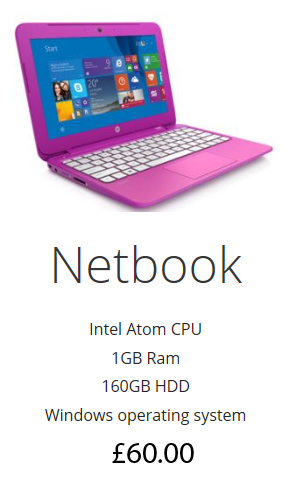 A bit beefier than the netbook. Larger screen, better battery life and quicker. Still not suitable for gaming but would run Microsoft Office for the casual word processor. Typical screen size is 13″. 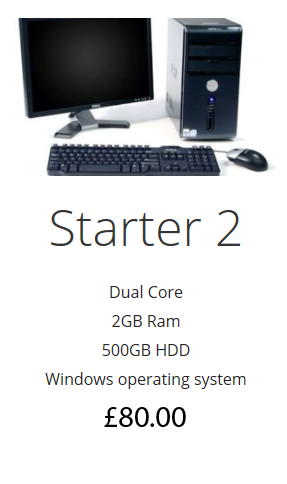 A little more storage and a little bigger hard drive than the starter 1, still too small though for a Office computer. Typical screen size is 13″. The Mid-Range Laptops off the Intel Core i3 processor which was specifically designed for using business applications. This will do all of the previous laptops but run Office much smoother and quicker. Typical screen size 13-15″. 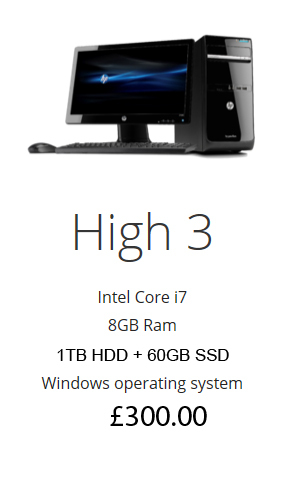 More storage and more memory means Windows and Office will run better than the lesser model. Typical screen size is 13-15″. 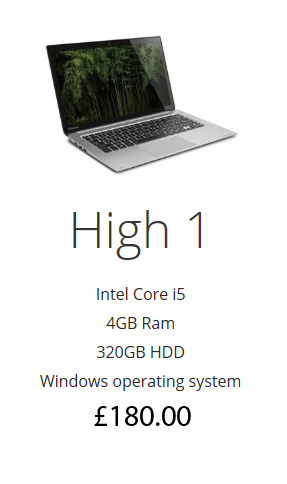 With our experience, the minimum laptop needed to run Microsoft Office efficiently. 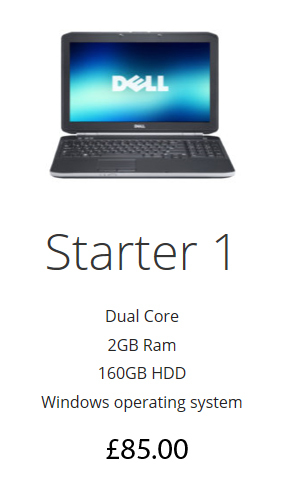 Better laptops are below, but this one will do your normal day to day stuff and also little billy’s homework too. Twice the memory as HL1, this will run quicker. 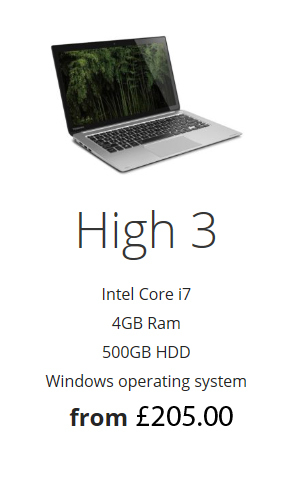 The only laptop worth considering if you want to play games that aren’t little webgames. A proper business processor chip. Upgrades to the memory are available to beef it up even more. Also available are those with “Mobile” graphics cards which will play the higher end of the gaming out there. The equivalent desktop to Starter Laptop 1. The advantages of a desktop are that they are more robust than a laptop and can have larger machines “upgraded” far easier, separate bigger keyboards and proper mouse. The disadvantage is that they aren’t really portable and a bit pointless trying to put one on your lap! Generally though, a machine that your child can sit at a desk and do their homework in a more comfortable setting. Twice the memory of SD2 means it runs faster. These desktops are now where you can start using Microsoft Office with them. Throw more memory in them and they will run quicker, put a bigger hard drive in them and they will store more. Always remember though; the faster the processor, and the more memory and your desktop will be a happier machine and therefore you will be a happier user. These desktops will run some of the less intensive games but not the GTA or Far Cry’s that are out there. Twice the storage of MD2 means it can save more documents/music/films to it. Much better processors than the mid range will mean they can do more things at the same time and won’t slow the system down too much. With Core i5 processors, they will run Office much better. More memory than MD1 means it runs quicker. An SSD (Solid State Drive) will mean that Windows will boot up a lot quicker than using a slower spin drive, but a huge spin drive for your data and applications complements the boot speed. 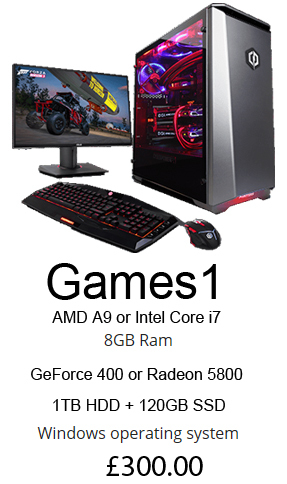 This system will probably play better games as well, but it has the upgradability to put a proper games graphics card in it for a little bit more money. The i7 processor inside will quicken the system and allow the user to do more things at the same time than the lesser models. For the user that wants to play proper games. Games that play far better than on a console. The main reason why a games console user would want to play them? As it enables “Console Commands” like God Mode. These Games PC’s will do all of you business and office needs easily and play the polygon hungry first person shooters as well. The difference between Games 1, 2 & 3? Better processors and better graphics cards which means they will play more up to date games. Better processor and better graphics card than Games 1. Better processor and better graphics card than Games 2. All of the above come delivered and installed (check on ordering for location base of delivery) and have a 3 month return to base warranty. If you have a problem with any of them (as long as they haven’t been modified, or had a virus attack) we will fix them, replace them with an equivalent model or give you your money back if they cannot be fixed/replaced.